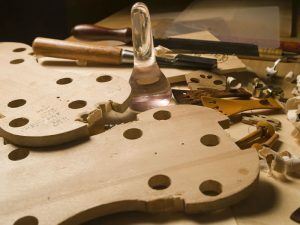 Most of Martin’s violins are inspired by the masterpieces of Giuseppe Guarnerius del Gesu. Stradivari and Amati models are also available. Giuseppe’s grandfather Andrea Guarneri and the Brothers Amati guide his viola designs. These instruments are not copies, instead each is tonally perfected according to the Cremonese system and artistically interpreted to create an individual instrument, each with its own personality.